Just steps from the international border you’ll find a true outlet shopping mecca. It’s Las Americas Premium Outlets®, located at 4211 Camino de la Plaza (619- 934-8400), home to an incredible collection of 125 designer and name-brand outlet stores that offer something for everyone. This attractive outdoor center is part of the family of Premium Outlet Centers® with locations across the United States, Mexico, Japan and Korea. Las Americas Premium Outlets is open Mon.–Sat., 10 a.m.–9 p.m.; Sun., 10 a.m.–7 p.m. with extended hours for select sales and holidays. 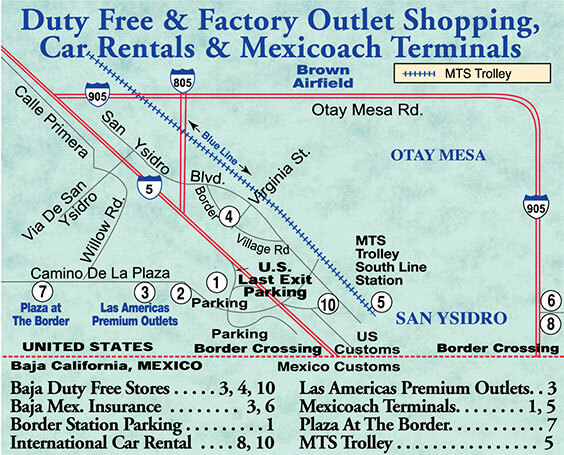 Las Americas Premium Outlets is conveniently located just 20 minutes south of downtown San Diego. From I-5, take the Dairy Mart Road exit, go one-eighth mile and turn left onto Camino de la Plaza. The center is one mile on the right. From I-805, exit Camino de la Plaza, the last exit before the international border crossing into Mexico. Turn right and go one-eighth mile, the center is on the left. Las Americas Premium Outlets is well known on both sides of the border as a top shopping destination for finding quality at unbelievable savings. 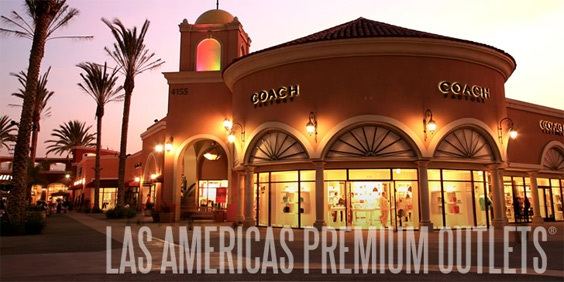 At Las Americas Premium Outlets you’ll find stores including Ann Taylor, 2b bebe, Banana Republic, BCBG Max Azria, Brooks Brothers, Calvin Klein, Coach, Gap Outlet, Guess, Izod, J.Crew, Kenneth Cole, Lacoste, MaxStudio.com, Nine West, Polo Ralph Lauren, Tommy Bahama, Tommy Hilfiger and many others. The most popular names in sports and sportswear are all here and the savings are impressive. You’ll find Adidas, Converse, Hurley, Nautica, New Balance, Nike, O’Neill, Puma, Skechers and Vans. For everything for kids, head to The Children’s Place Outlet, Disney Store Outlet, Gymboree and Stride Rite Keds Sperry. In addition to great clothes, you’ll find savings at a wide range of stores. Be sure to check out the beautiful jewelry at Daniel’s Jewelers, Swarovski and Zales Outlet. Don’t miss a visit to UETA Duty Free which offers duty-free and tax-free savings on a wide variety of fragrances, accessories, tobacco products, liquor and beer. Save time to eat at one of the many restaurants and eateries including Achiote, a Mexican restaurant with an authentic Tijuana flavor, IHOP, Starbucks Coffee, Subway and more. Plus there’s a large food court with a wide variety for all tastes. Las Americas Premium Outlets offers many customer services including stroller and wheelchair rentals. Gift Cards, which are accepted at all stores, can be purchased at the Information Center. Las Americas Premium Outlets offers savings of 25 to 65 percent every day and has annual sales during the weekends of Presidents’ Day, Memorial Day, Fourth of July, Columbus Day and Labor Day for even greater savings. Plus, the famous After Thanks giving Weekend Sale featuring Midnight Madness kicks off at midnight as Thanks giving ends and continues with special savings through Sunday. It’s a shopping event not to be missed. Visit premiumoutlets.com for a complete list of current stores, detailed information on sales, center hours, local attractions and accommodations, and much more.